The Russian Orthodox Church has, together with the other Orthodox Churches, a longstanding system of honours and awards for clergy and laity. These honours and awards range from highly prestigious medals and crosses bestowed by a Patriarch or Synod through to Diocesan and parish certificates of appreciation. Regardless of their status, by recognising exemplary service and other good works all such honours and awards edify the faithful and encourage them in their own Christian service. 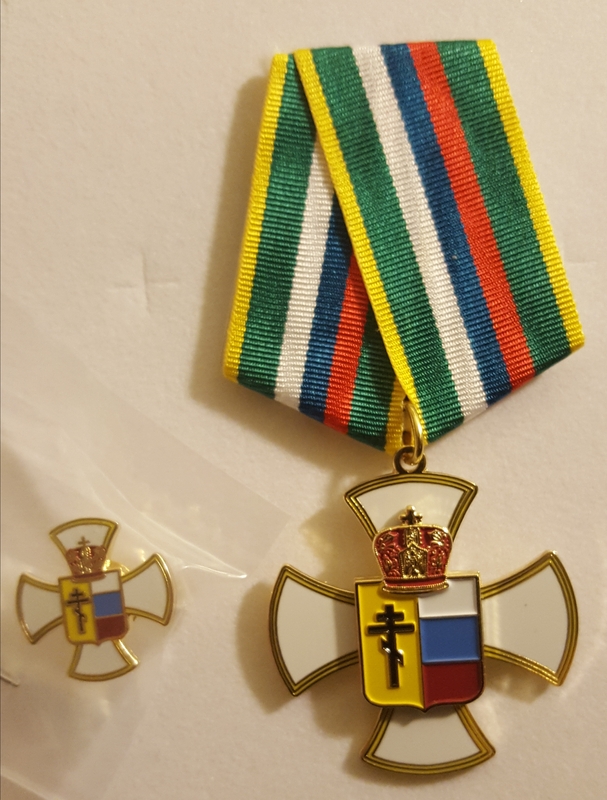 The Australian-New Zealand Diocese of the Russian Orthodox Church Outside Russia has two permanent awards that are bestowed for service of such a kind as to have significance for the whole Diocese. These are the episcopal gramota, or certificate, and the Diocesan Cross. In addition, there are from time to time awards given to mark occasions of particular significance in the life of the Diocese. Examples include the badge, medallion and cross minted on the occasion of the 1000-year anniversary of the Baptism of Rus’ (1988) and the medal minted in honour of the fiftieth anniversary of the establishment of the Diocese (1998). Photographs of some of these awards - with explanatory notes in Russian - can be viewed here. Diocesan awards may be granted to both clergy and laity. 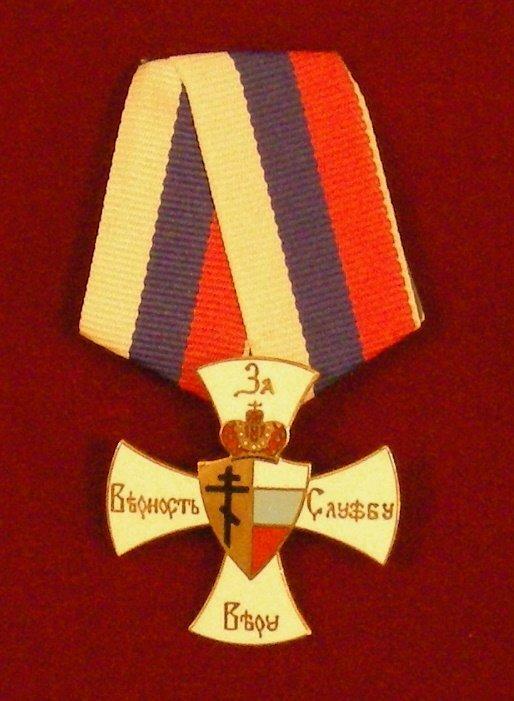 If granted to clergy, Diocesan awards are given in addition to the awards for length and diligence of service customarily bestowed upon clergy in the Russian Orthodox Church. Diocesan service is also taken into account by the Ruling Bishop or by the Synod of Bishops, as the case may be, when bestowing such awards. Two forms of episcopal certificate are used in the Diocese. 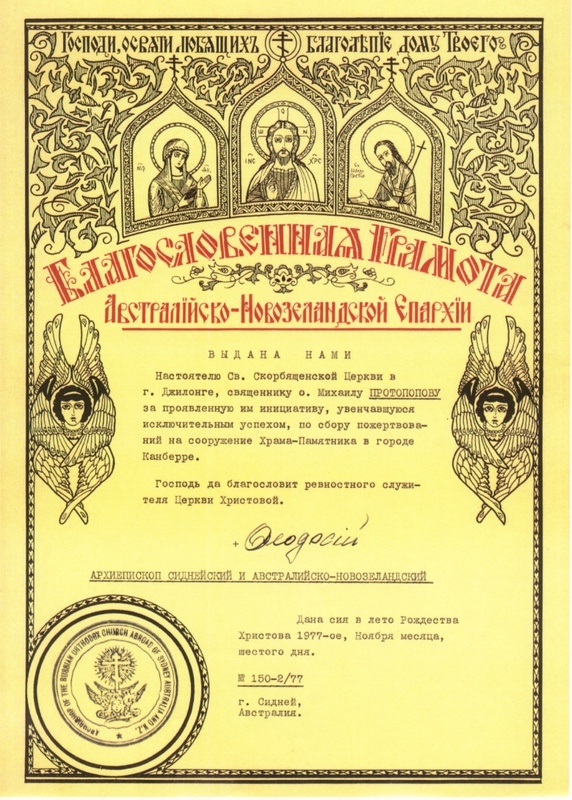 These are the Certificate of Archpastoral Gratitude («Архипастырская Благодарность») and the Certificate of Hierarchical Blessing («Благословенная Грамота»). Although from 1996 only the Certificate of Hierarchical Blessing has been used in our Diocese, both may still be bestowed. If bestowed, the Certificate of Archpastoral Gratitude is given first. An episcopal certificate is given at the discretion of the Ruling Bishop. If given in recognition of service to a parish, representations to this end will generally be made to the Ruling Bishop by the parish rector. If given in recognition of service to the Diocese, representations to this end will generally be made by the Diocesan Council. The episcopal certificate is the usual form by which service of significance to the whole Diocese is acknowledged. It may be awarded on more than one occasion. Upon receipt of a third episcopal certificate of any kind, a person will automatically be considered for the Diocesan Cross. The Diocesan Cross was instituted in 1989 by the ever-memorable Archbishop Paul (Pavlov), Ruling Bishop of the Diocese from 1980-1992. It was intended to be, and remains, the highest form of recognition at Diocesan level. As such it is awarded once, and only for the most distinguished service to the Diocese. The Diocesan Cross is awarded by the Ruling Bishop upon the recommendation of the Diocesan Honour Committee. The Honour Committee is comprised of the four deans of the Diocese. If given in recognition of service to a parish, representations to this end will generally be made to the Honour Committee by the parish rector. If given in recognition of service to the Diocese, representations to this end will generally be made by the Diocesan Council. There have been two strikings of the Diocesan Cross. The first was in use from 1989 until 2016. The second striking - in which the medal was substantially redesigned - was in 2016. Although the Diocesan Cross is a single-class award, a small number of decorated Diocesan Crosses of both strikings have been awarded. For example, the Diocesan Council presented Metropolitan Hilarion with a decorated Diocesan Cross in November 2016 to mark the twentieth anniversary of his service as Ruling Bishop of the Australian-New Zealand Diocese. As of 2016 any clergyman of the Diocese who has rendered thirty years’ service from his ordination to the diaconate is automatically considered for the Diocesan Cross. The Diocesan Cross is presented together with a special certificate. Recipients are also given a small lapel badge to wear on less formal occasions. A recipient of the Diocesan Cross who renders further distinguished service will be considered for a Synodal award. In January 2011 Metropolitan Hilarion asked parishes of the Diocese to develop their own systems of awards to recognise people who work without recompense for the good of their parish. He suggested the presentation of parish certificates of appreciation, icons, and other suitable items at official ceremonies or on appropriate occasions. Our parish subsequently adopted a framework for parish awards to recognise the service of parish officials, members, volunteers, benefactors and sponsors. Parish officials are, in general, recognised by the parish after ten years of continuous service, and at five-year intervals thereafter. Service for lesser periods may be recognised at the discretion of the Rector or Parish Council. For continuous service of twenty-five years, Diocesan recognition is sought. Members are, in general, recognised after twenty years of continuous membership, and at five-year intervals thereafter. Volunteers are, in general, recognised by the parish after ten years of continuous service, and at five-year intervals thereafter. Service of particular importance in parish life may be recognised at the discretion of the Rector or Parish Council before ten years of continuous service. Benefactors and sponsors are acknowledged on a case-by-case basis. The initial form of recognition is always in the form of a commemorative certificate. A beautiful certificate was designed for this purpose by a member of our Parish Council, Olga Bogacheva. It incorporates elements of the parish Icon of the Mother of God, “Protectress of Newcastle”. To date, all subsequent awards have generally been copies of that icon. As of October 2017, work is being undertaken to develop a parish medal to recognise exemplary service. In recognition of his diligent service as parish Warden and Treasurer and his contribution over many years to parish life. In recognition of his faithful service to our parish over many years. On the occasion of his one-hundreth birthday and in recognition of his work on the construction of our church and his contribution to the life of our parish. In recognition of her significant contribution to the life of the Russian Orthodox Church in Newcastle, particularly through her faithful service as a chorister in our parish and in the Russian Orthodox Church of the Theophany in Mayfield, NSW. In recognition of her devotion to the parish, her care for the cleanliness and order of the church, and her faithful service as a chorister over many years. In recognition of her significant contribution to the life of the Russian Orthodox Church in Newcastle, particularly through her exemplary and unmercenary service as the conductor of the parish choir. In recognition of her support for our church and for the Russian-speaking community in Newcastle. In recognition of his significant contribution over many years to the life of the Russian Orthodox Church in Newcastle and his twelve years of faithful service as the Warden of our parish. In recognition of her significant contribution over many years to the life of the Russian Orthodox Church in Newcastle, both in our parish and in the Russian Orthodox Church of the Theophany in Mayfield, NSW; her devotion to both parishes; her fundraising; her care for the beauty and cleanliness of the church; and her faithful service as a reader and chorister. On the occasion of her retirement from the Parish Council after more than sixty years of diligent service as a Parish Council member and as Head Sister. The eldest son of Archpriest John Lupish, Subdeacon Vitaly Lupish has been active in the life of our parish since it was established in 1952. His service to the parish has been long and exemplary. Following the repose of his father in 1977 he was for many years the main point of contact for Russian Orthodoxy in Newcastle. He designed our church and hall and participated in the construction of both. He has served on the Parish Council, represented the parish at Diocesan Assemblies and in community organisations, conducted the choir, read at the divine services and changed the altar vestments. He was tonsured a reader and ordained subdeacon by Archbishop Paul (Pavlov) in May 1984. Previous awards include a medal on the Fiftieth Anniversary of the establishment of the Australian-New Zealand Diocese in 1998 and a gramota from Archbishop Hilarion in 2004 on the twentieth anniversary of his tonsure and ordination. Irina Lupish has been active all aspects of the life of the Russian Orthodox Church in Newcastle for fifty years. The organiser of youth and community activities in our parish in the 1970s and 1980s, she was later the mainstay of the Theophany parish of the Moscow Patriarchate from 1994-2009. She received a Patriarchal gramota for this work. She showed great leadership in helping to bring our parish and the Theophany parish together in 2009 and has since been an energetic Parish Council member, chorister, and member of the Ladies' Auxiliary. Mrs Morhun has been active in the life of our parish since it was established in 1952. She has been a member of the Parish Council and active in the Ladies' Auxiliary for most of that period, filling the role of Head Sister for over fifty years. She continued to be actively involved in church life well into her nineties, cleaning the church and changing vestments. She received a gramota from Archbishop Sava (Raevsky) in 1964 and a medal on the Fiftieth Anniversary of the establishment of the Australian-New Zealand Diocese in 1998. These awards are generally after service of three, ten and fifteen years respectively, although individual circumstances will vary. The double orarion is bestowed at the discretion of the Ruling Bishop; higher awards are bestowed by the Synod of Bishops. These awards are generally given at intervals of no less than three years. 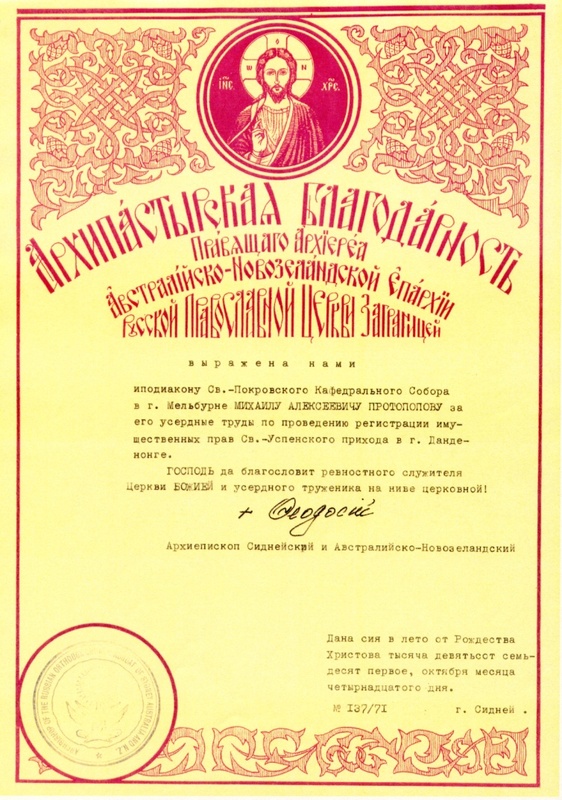 Awards up to and including the kamilavka are bestowed at the discretion of the Ruling Bishop; higher awards are bestowed by the Synod of Bishops. Other awards, far less commonly given, recognise particularly long and distinguished service. 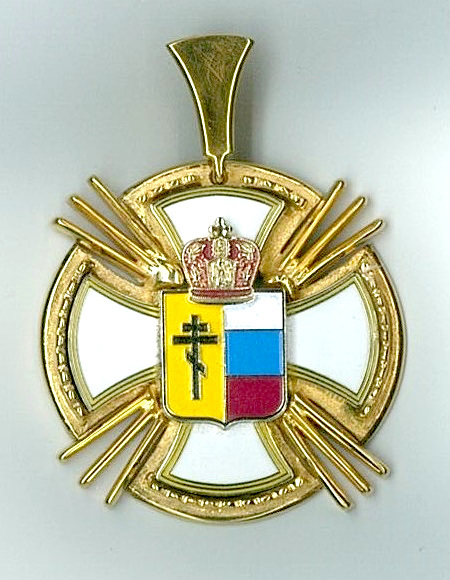 Such awards include the right to wear the mitre or a second pectoral cross. Clergy awards are generally given publicly in a liturgical setting, most commonly on the occasion of an episcopal visit to the parish of the clergyman so honoured, or some other significant liturgical occasion. The receipt of these awards in such a setting is an honour in itself and the award will, for the most part, be evident whenever the deacon or priest is vested for the Divine Services.